Lili, who blogs at Rescue Dogs the Movie, is nine years old—the perfect age to review No Shelter Here! I just got this FABULOUS book from the library yesterday. It’s called No Shelter Here. I LOVE IT! It’s very sad knowing what things are happening to dogs, but it just reminds you to give your dog extra love. It also tells you about great websites to visit that have to do with Animal Welfare and Shelter Dogs.With each dog problem it tells you about, there’s one story of someone who helps make the world a better place for dogs.Thank you, Rob Laidlaw, for making the world a better place for dogs. 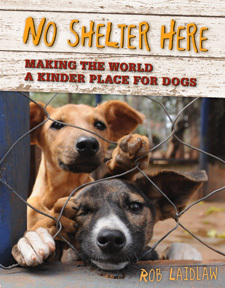 No Shelter Here is brimming with fact — for example, listing “What every dog needs,” shining a spotlight on puppy mills and “free-ranging” or street dogs. There are dogs all over the world longing for a good home and, more specifically, desperately needing young champions like the kids showcased in the book to step up and learn all they can about dogs before jumping to acquire one. “If you can’t meet a dog’s needs right now, then it’s best to wait.” Young readers will be entertained and enlightened by No Shelter Here, while the cats of the world wait patiently for Rob Laidlaw to shed light on their lives.